Inside the mind of Writer, Producer, and Director Jordan Peele there must be a menagerie of ideas and visuals that would trouble most people. In Peele’s second offering, Us, there are both humor and thrills and like his debut Get Out, a lot of underlying messages to unpack. This film is not, Get Out, and it is important to say that. There’s no teacup or spoon in this film but there is relationship and dialogue that you must pay attention to closely. As it opens we find a young Adelaide Wilson, on a trip to the beach in Santa Cruz with her mom and dad in 1986. After walking off she discovers something that changes her world forever. 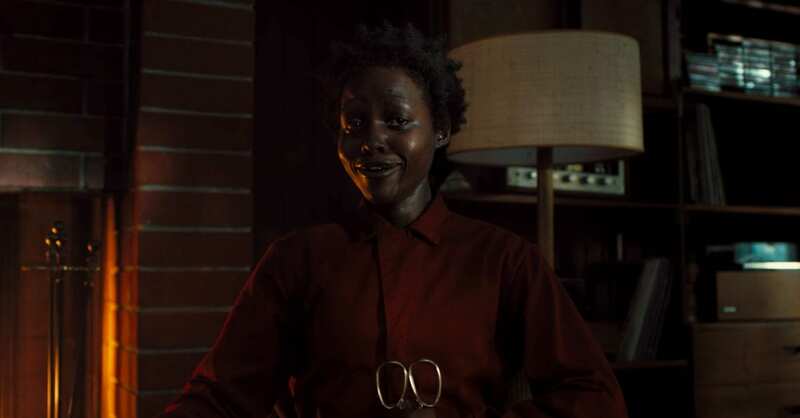 Fast forward to the present day we see a seemingly well adjusted Adelaide, played by Lupita Nyong’o, along with her nice guy some may say cornball husband, Gabe (Winston C. Duke) and children on a trip to grandma’s house. They are your typical black family under ideal circumstances; they laugh, they argue, and they exchange looks when dad is being extra corny. It is all very sweet even for Adelaide who is still troubled by her experience. Things become unsettling for her when Dad announces he has planned a family trip to the beach in Santa Cruz. The events that take place over the next 90 minutes is where Us really takes off. I would hope to guide you in your viewing of the film by saying don’t look too deeply in to what you see or else you will be trapped into waiting for a Get Out experience. Enjoy what is going on around you and let those hidden things come in their own time. In an interview on Late Night with Jimmy Fallon, Peele made mention of the term, ‘duality’ this term is very integral to the film. What the character refers to as the ‘untethering’ that is to occur is the driving force that propels both Antagonist and Protagonist as the film lays out the plot and conflict, while things may progress slowly to some moviegoers waiting for action or something horrific, please hold on or else you will miss something crucial to understanding the films climax. It must be noted that there are careful distinctions being drawn in relation to how blacks may behave in scary movie situations, Peele was genius in doing this. We all know there are just some situations we won’t allow ourselves to get caught up in. These moments add humor to great performances from the Wilson family. Character dialog is also very crucial to consuming this film. There are two scenes that standout, it is the first and last encounter between the adult Adelaide and her doppelganger. It is my opinion the film itself hinges on understanding these two instances. Us is categorized as a Horror film. Personally I am not sure what that even means anymore. The last movie that horrified me was actually his ‘Social Horror’ film, Get Out. Let’s file this one this under Pyschological Horror because it really does a number on you with Peele’s adept handling of the genre, cultural norms, and fantasy. Lastly, I would like to offer that the actingand directing of this film was just and a joy to experience. I am going to see the film again and encourage others to watch it twice. Look me up on Social media and let’s discuss the films fine points. I give Us, 3.5 stars. I only wish it were longer and clearly resolved a question but then again, perhaps it is that lingering question that makes Us, so damn good. Lots of dreams and intelligence. God blessed and trying to represent #BlackExcellence.